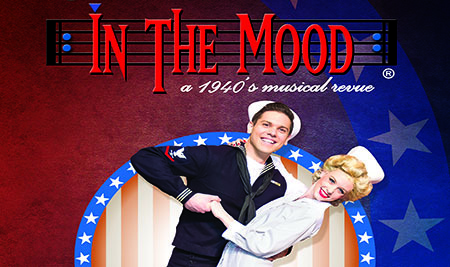 IN THE MOOD aspires to promote the memory of this most significant time in American history and continues to inspire audiences of all generations. For over 2 hours this big retro event will hold audiences enthralled with its singers, dancers and period costumes, fine orchestral arrangements, vocalists delivering songs from the 30s and 40s, choreographed dance routines and shear American pizzazz! The unique combination of the sensational String of Pearls Big Band Orchestra, the IN THE MOOD Singers and Dancers as choreographed by Broadway choreographer Alex Sanchez, will be the highlight of the season in a musically jam-packed performance. Treasures such as Swingin’ on a Star, Tuxedo Junction, Boogie Woogie Bugle Boy, Sing Sing Sing, Chattanooga Choo Choo, I’ll Be Seeing You, La Vie En Rose, Take the A Train and The Last Time I Saw Paris are just a small part of a program that leaves audiences cheering.